Thanksgiving is just around the corner, which means Christmas is coming soon! 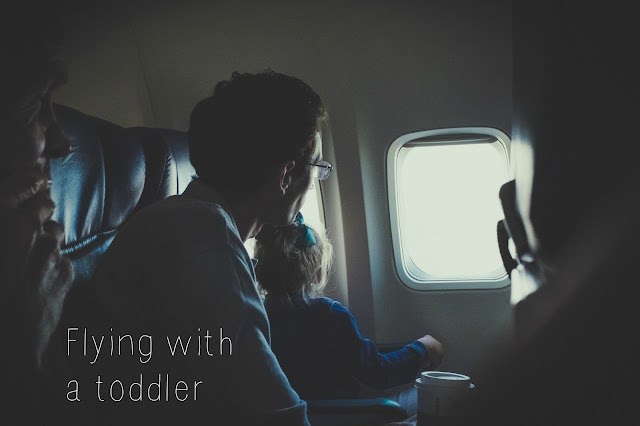 If you're traveling for the holidays, I'm guessing you already have your tickets booked, but if you're traveling with a little one, don't pack your bags before you read my tips to keep your tiny traveler busy and happy on the plane. I've been flying cross-country with K since she was about six months old. She's always been a great traveler; she doesn't sleep quite as much as she used to, though, so I've had to get a little resourceful with our in-flight entertainment. I've put all my tips together, but give them a read and pick what's appropriate for your kiddo. Pack lots of small, itty bitty snacks (rice puffs, Cheerios, goldfish crackers, marshmallow bits, dried fruit) in Ziploc bento boxes like these. I find it easier to pack several snacks together so they can choose. I also like to, um, decant? the snacks in one of these snack cups, especially if the child is an independent eater. The top slows them down--the name of the game here is longevity. A puppet & a small/thin blanket. You can make up stories, play hide & seek, build a fort. Those muslin blankets are perfect for this, as they don't take up much space but are huge. Static cling stickers. Dollar Tree has these for holidays, so I grab a couple of packs and roll them up into a paper towel tube. They'll stick to the plane window, the TV screen, and each other, so you can pile the Santa Doggies one on top of the other. If your kid's a little bigger and likes imagining, these reusable sticker pads are awesome! They come with themes and appropriate backdrops, but they stick to glass too. (You'll actually get more for the money with one of these versus the static clings.) Again, the peeling and sticking can really take a long time. Perfect. Anything with a button and a light. I have a blue pig LED light key chain from some freebie booth that was perfect for this. The light only stays on if you're pressing it, which somehow makes it more enticing. A Matchbox car + that paper towel tube. We played tunnel for HOURS. I'd hold up the tube, she'd drop the car in, and it'd land in her lap. HILARIOUS. Silly Putty. Same tactile experience as Play Doh, but not as messy. Expect a baggage check on this one. Stickers & index cards. Big packs of tiny stickers are pretty cheap. Peeling them off is great practice for hand-eye coordination and fine motor skills, and sticking them on index cards is a little easier to manage, I think. I ordered something like these fun emoji stickers a whiiiiile ago, and we still have tons. Bubble wrap! Technically not safe for little ones, but I'm not suggesting you leave your kid with a sheet of plastic while you jaunt to the lav. It's tactile, it's gratifying, and the cabin noise of the plane is loud enough to drown out the POP for nearby seatmates, especially if you sit near an engine. If the kid's a coloring fan, these triangular crayons are a MIRACLE and won't roll off. A new book + an old favorite book, especially one that has flaps or a counting or finding element. Glow sticks! Save these for the dark parts of the flight, obviously. We had the smallest rave ever, made faces with them on the tray, and linked them all together to see how long we could make them. These headband earphones are awesome for kids who don't like earbuds or who have a hard time keeping regular headphones atop a smaller noggin. If you really want to watch Moana for the 500th time along with her, get a headphone jack splitter. Use nighttime diapers for added protection. I'd still try to change them at daytime intervals, but I'm not begging anyone to let me do a diaper change mid-flight. A little extra absorbency can mean the difference in a leakout and a wardrobe change--also not the easiest thing to do, especially if you're doing this thing as a solo parent. Bring a change of clothes (or two) for the little one, and an extra shirt for yourself. There are a lot of ways your cleanliness could go south. You know the stakes. Bring baby wipes and disinfecting wipes. Some restaurants have disposable plastic place mats that adhere with a peel & stick edge. Grab a few and stash them in your diaper bag. Car seat or not to car seat? This is a tricky one. I used the bucket seat on the plane once when she was six months old, and it was fine. It's pretty lightweight and easy to install. I've taken the big heavy one on a few trips, starting when she was about a year old. It's a beast to get through the plane and install, especially because K & I traveled without Josh some. A borrowed car seat travel cart was a lifesaver. I strapped our carry-on bags in the car seat, then I could hold her hand or carry her while I wheeled everything behind me. Now that K can sit in the airplane seat and reach the tray, I just check her car seat at the counter. Most airlines allow you to check essential baby gear (stroller, car seat, etc.) for free. What's made your travel with a little one easier? Let me know! We're leaving in a few weeks!